The Digital Supply Chains Consortium is a unique collaboration between industrial member companies and the Institute for Manufacturing. It brings together some of the world’s leading firms and academics, all of whom are focused on delivering the tools, education and insights needed for the supply chains of the future. undertake pilot projects (optional) that develop and embed those capabilities to enable transformation of their digital supply chains. The Consortium covers the ten future digital supply chain scenarios developed by the Institute for Manufacturing. These scenarios were designed with insight from a range of multinational companies concerning their latest experiences of the impact of digitisation on global manufacturing and supply networks. The diagrams below outline these ten scenarios. 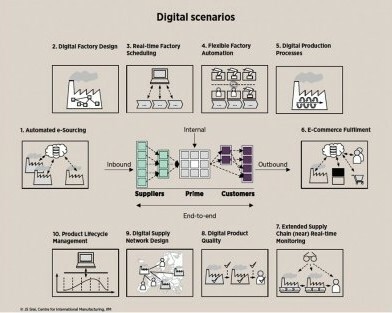 View the ten future digital supply chain scenario diagrams. Annual re-assessment of your company's maturity level in digital supply chains technologies and skills, conducted in-company (1 day workshop) leading to tailored transformation plans. Contribute to and learn from other members' experiences, taking part in annual face-to-face meetings (September) and teleconferences (January, April and July). Members of the Consortium also have the option to work on co-development projects which are individually tailored and managed independently. These projects will involve joint member/IfM teams of practitioners and researchers. Through these projects we will work with members to co-develop and embed digital supply chain capability into their organisation, transforming their operations with real business impact.